Photo sharing services like Flickr and Zooomr are popular as ever. Unfortunately, uploading your photos using the web interfaces often provided can often be a little bit of a painful experience (Zooomr's uploader even crashes Firefox on Linux). 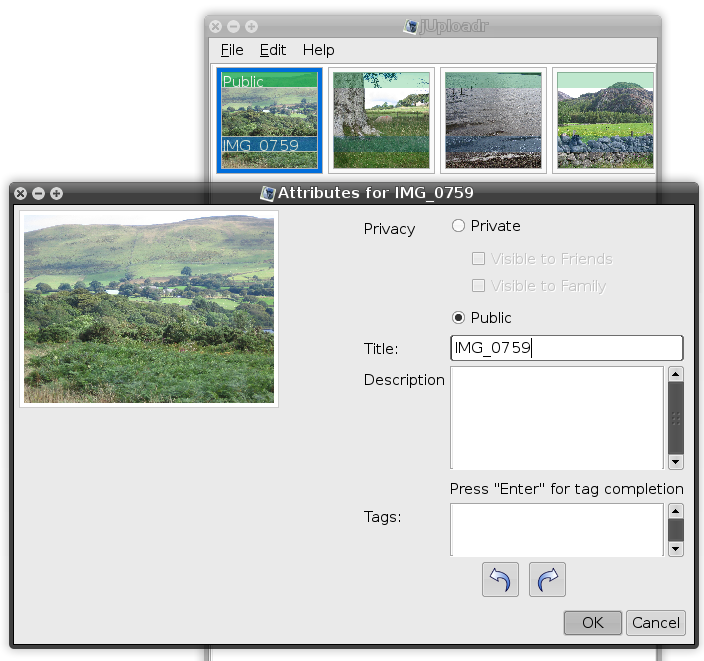 While Jacob has covered Postr, a GNOME program for uploading to Flickr, there are also alternatives, such as jUploadr. jUploadr is Java-based and cross platform (Linux users can refer to my recent Java tutorial to get Java). It provides a fairly simple interface where you can drag files onto the main window, then edit the data such as tags, title and so forth before batch uploading. As I mentioned it supposedly works with both Flickr and Zooomr in theory, but there are ongoing problems and apparently it doesn't work at the moment. Still, it is a very good batch uploader, works on Windows, Linux and Mac OS X and is a very good alternative to some of the other uploaders out there. Get Java, then give it a try!